John Wilf is kindly loaned to me each year by Mrs Francis Hogg of Appleby. He has a lovely kind personality and i love him dearly. 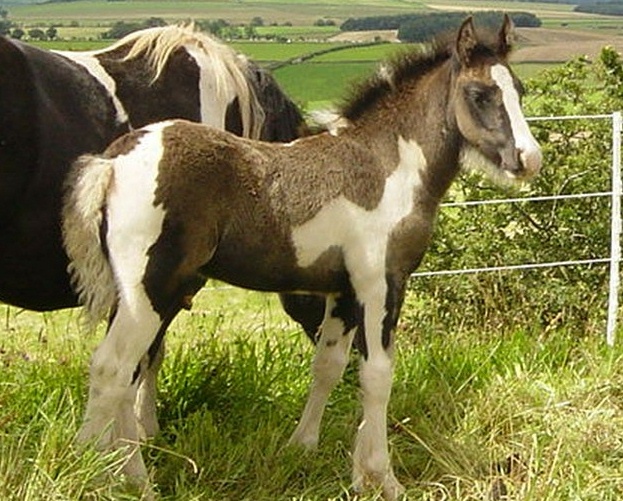 He is clearly homozygous for the tobiano gene and must have both black and red genes in there as he has thrown the odd red and white foal. All his foals seem to inherit his nice personality, quiet disposition and wonderful bone, many have lots of feather too though not all, mum has something to do with it. He has thrown foals measuring 15.2hh as 2yr olds but equally smaller ones are produced, he really is a universal stallion and is always welcome here. 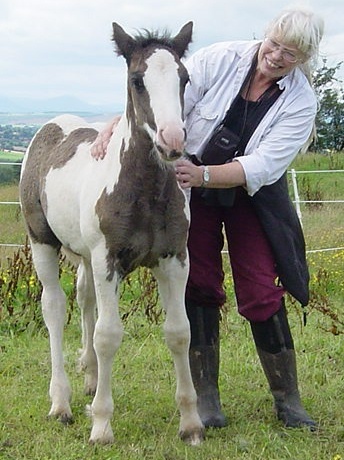 Ellerbeck Spangle, a typically friendly John Wilf foal. He was born in July 2008 and is out of Duchess who is now in Devon. Spangle is now owned by Charlie and if he behaves himself will hopefully have a home for life with her. and a 4th in the coloureds as his topline isn't there as much as the other horses (that judge loved him, we're going back next week he had people taking his photo........ "
This is Ellerbeck Banquet with her mum Ellerbeck Gala. Banquet was foaled in 2006 and is now in America in the safe care of Anna who also has another John Wilf filly called Park Rose Lee. Update:- Banquet has now moved on to Sue Styx in Michegan who has backed her and absolutely loves her to bits. Park Rose Lee also went to Anna in the USA along with Banquet. I always really liked her, she is very gentle and sweet-natured. Oh I must explain that this filly was bred by John Wilf's owners and I bought her from there, hence the Park prefix. Ellerbeck Fabian is still with us as his sale fell through. another super sort out of Feather and looking for a good home. See the for sale page 2009 for more recent pictures. Here is Ellerbeck Foxglove out of Feather, sister to Fabian, Pharoah, Fabian and Freedom and half sister to Tonto. She was born the same year as Banquet in 2006 and is now with Linda near Lancaster and one day Linda hopes to breed from her. Foxglove is out of Ellerbeck Feather who is also mother of my young stallion Freedom. Update, Linda may have to sell Foxglove so if interested get in touch! Guess what! I have bought her back so will have to decide what to do with her, she is broken now and needs riding on so I may well be looking for a kind and knowledgeable home for her. I only bought her back because i want to try to ensure she has a good future and haven't a clue what my plans for her will be but I don't really need her here so a good pony could be on the go at a very reasonable price..
Latest is that Foxglove has now gone to Roma in Scotland who thinks she may show and possibly drive her both of which she can probably excel at. ....and she is back again, not her fault, will have to call her yoyo!!!!!!!!! Pharoah has now moved on though Jemma tells me she has had her regrets about that since! we will have to send her another ellerbeck baby. Another gorgeous homozygous filly from Gala. This is Ellerbeck Masquerade and she was foaled in 2007 and she is now in Devon with Sean and family. Here is Ellerbeck Admiral (usually known as Khan). He is out of a heavy Dales type mare who is on loan here and was born in 2007. I did have him sold but was given backword so he is now gelded and available for sale. 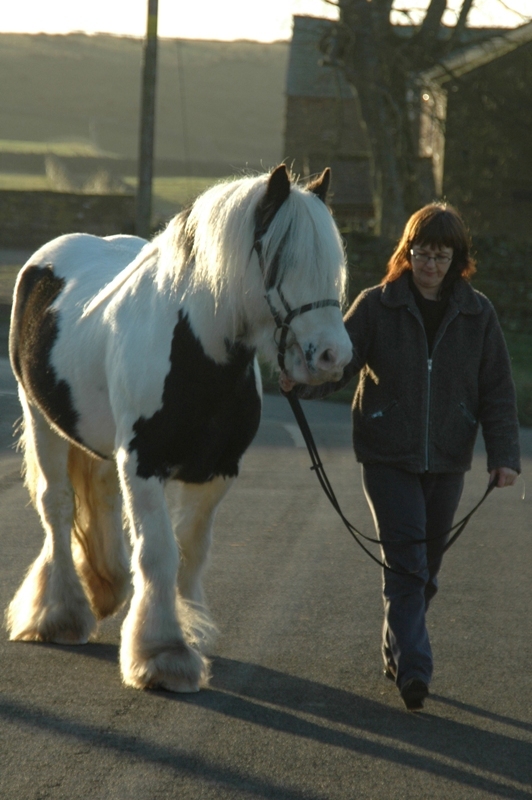 He is now a strong limbed magnificent cob who is developing plenty of feather and is presently available for £1750 though will be worth more once matured and we get him riding and driving. We intend to try him in harness when old enough and he should make a smashing riding cob well up to weight. I suspect he will easily make 15hh. This was taken in 2005 and shows John Wilf with his son and daughter, Ellerbeck Freedom and Ellerbeck Parade. Freedom is of course now retained and has already produced several foals.